The Proper Study Of Mankind: The Path To Intelligence? New research suggests that it is not brain size that determines ‘braininess’, but the way that the brain develops. According to the adage, sometimes the journey taken is more important than the destination reached. And now this seems to be true of brain development and intelligence. A paper in the current issue of Nature suggests that differences in intelligence as measured by IQ tests are related to how the brain grows to its final state (which, in this case, probably affects the destination too). 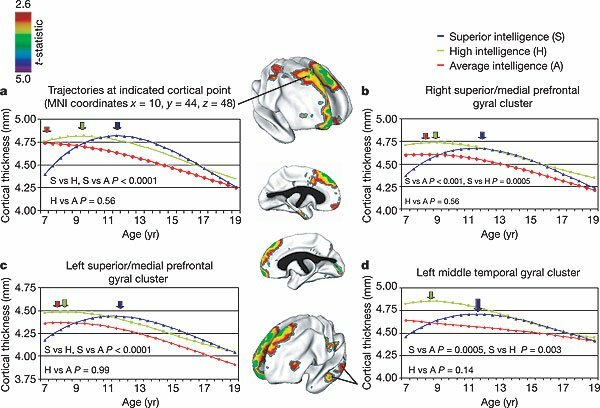 The results show that different growth trajectories of a brain region called the cortex, and the rate of change in the thickness of the cortex at different points in development, vary with IQ. It is not the overall thickness of the cortex that relates to intelligence, as might have been supposed, but how the cortex develops. Research on intelligence, and the comparison of IQ across individuals and groups, is a controversial field. Concerns have been raised about the validity of IQ tests to measure intelligence, and critics have also questioned whether there is a unitary cognitive faculty that can be identified as ‘intelligence’. What’s more, theories of intelligence and IQ testing have historically been misused by a variety of eugenicists and racists pushing particular ideological agendas. Studies on the genetic basis of intelligence are also seen by some as dangerous because they could, if misused (so the argument goes), undermine our general notions of equality and the drive to provide equal educational access regardless of supposed talent (the fear being that some might say “If some people are born stupid, why waste educational resources on them?” There are good reasons why such a comment does not follow from research on intelligence). The fear remains that modern researchers, if not explicitly abusing the concept of intelligence in this way, at least provide a basis for a supposedly scientific approach to discrimination and prejudice. Although we should certainly take heed of historical precedents in intelligence research, some of the modern fears about such studies are surely misplaced (see Steven Pinker’s The Blank Slate for a robust explanation of why these fears are largely unfounded). IQ tests that assess the three ‘Rs’ – reading, writing and arithmetic – do, however, seem to measure some aspect of cognition that is predictive of later skills and achievements that are widely considered, at least in Western societies, as bearing the hallmark of ‘braininess’, or high intelligence. And so research has continued on this tricky aspect of the mind from a variety of different directions. Behavioural geneticists have used twin studies to work out the degree of heritability of intelligence (IQ scores), which usually comes out between 50-70%. This figure is often misunderstood, so a quick clarification is in order. Heritability measures the amount of variation in a trait than can be explained by genetic variation. So between 50-70% of the variation seen in IQ scores is attributable to genetic variation. It does not mean that for any given individual 50-70% of their IQ came from their genes, with the remaining coming from their environment; that doesn’t make any sense. Heritability doesn’t even measure the ‘strength’ of the genetic contribution (whatever that might mean) – a trait can have low heritability and yet still have an important genetic underpinning. Take the trait ‘leg number’ in humans. Nearly everyone will have identical genes for building legs, and so there is no genetic variation to explain any differences in leg number that we observe – differences will be attributable to environmental differences (accidents, disease or the presence of teratogenic drugs during development). But that doesn’t mean genetic effects are unimportant in leg development. Assuming that IQ is related in some way to brain functioning, it is likely to have a genetic component: building a functional brain requires the orchestrated actions of thousands of genes and appropriate environmental inputs, and so building a brain of whatever intelligence will require genetic inputs. Heritability underscores this point by showing that some variation in IQ is attributable to genetic differences, which wouldn’t be the case if genes had no relevance to IQ (though, as noted, a low heritability wouldn’t rule a role for genes). Given the underpinning assumption of much cognitive neuroscience, that the mind is what the brain does, we should expect to find brain correlates of IQ. Total brain volume is one potential candidate, but it correlates only modestly with IQ, at about 0.3. But the brain is anatomically, and, to a degree, functionally, specialized, so perhaps it is more promising to look at specific areas of the brain suspected of being linked to IQ. So what areas of the brain might be the best bet to look at? The cortex is promising, as it is associated with higher cognitive functions – the sorts we usually identify as components of intelligence – and has also expanded disproportionately in human evolution (perhaps giving us the edge in cognitive prowess over our primate cousins). The cortex is a sheet of tissue that lies at the top of the brain, and its thickness can be assessed by brain-imaging techniques. In the new study, Shaw and colleagues used brain scans to look at cortical development, and how cortical thickness changed, in 307 people studied from childhood to adulthood, and who were also tested for IQ (which is relatively stable during development). Overall, cortical thickness showed a weak correlation with IQ (0-0.1), when all ages were considered together. However, when the brain-imaging data and IQ were studied according to age group, a number of age-related correlations emerged. Perhaps surprisingly, cortical thickness was negatively correlated with IQ in early childhood – among young children, a thicker cortex correlates with a lower IQ. By contrast, in late childhood cortical thickness was positively correlated with IQ – thicker cortex correlating with higher IQ. 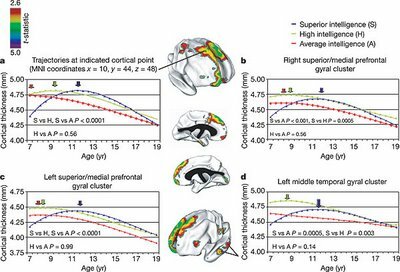 Another way of looking at the relationship between cortical thickness and IQ is to plot the rate of change of cortex thickness against age, again stratified by IQ in average-, high- and superior-intelligence groups. These results are shown to the left. Looking at the curve for the superior-intelligence group, the rate of change in thickness of the cortex is much more rapid than in the other two groups; this corresponds to the steep part of the blue curve in the first figure. The rate of change then levels out to that seen in averages and highs. Again, the averages show the smallest variation in rate of change in cortex thickness, with highs intermediate between average and superior. What both depictions show is that it is not how thick the cortex is at any given point that correlates with, and probably underscores, performance on IQ tests; rather, it is the developmental trajectory that the cortex is on that relates to IQ. It is tricky to explain these patterns. It seems counter-intuitive that people with the highest IQs should start with the least amount of cortex. However, this study does not show what brain development has gone before. Both growth and thinning of brain areas are important for brain development, and ‘pruning’ of excess neurons in the brain underlies the emergence of many functional brain areas – like a sculptor removing excess material from a block of marble that deviates from the desired design (and a smaller sculpture may not be worse, or less complex and intricate, because of its size). So perhaps previous bouts of growth and pruning create a cortex around age 7 that is better ‘optimised’ for the task measured by IQ tests in superiors than in others. In superiors, the cortex then undergoes very rapid growth, followed by the fastest rate of thinning, leaving a cortex roughly the same thickness as in other people, but better at certain cognitive tasks. But does this study say anything about the genetic determination of IQ? I think we should be cautious in drawing conclusions about this aspect of IQ development from this study. In talking about the results of this study, there is no reason to automatically invoke genetic factors over environmental factors in explaining the different cortical trajectories. It is likely, if not certain, that there are genes that are crucially involved in the development of the cortex; it is hard to see how it could be otherwise. And there may well be genetic variation that explains this variation in cortical development. But there could just as plausibly be environmental differences that explain the variation. Let’s say IQ is determined by the cortical growth trajectory; then what determines the trajectory? It could be that people from a given environmental background – whether that be classified according to diet, educational stimulation, amount of play in childhood or whatever – tend to respond by moving towards one or another developmental pathway. Indeed, the authors of this study did find a correlation of 0.35 between IQ and socio-economic status. And of course, there could, and are likely to be, interactions between genes and environment (and not in a simple linear, additive way). For instance, genetic differences might cause the initial set-up and growth of the cortex (or other brain areas) to differ in individuals. These differences could in turn make scholastic achievement more enjoyable (perhaps some people find it easier to remember things or can assimilate information more quickly), and so tend to lead towards the pursuit of those skills measured by IQ tests. One other possible moral that could be drawn from this research is that it illustrates the importance of plasticity in development, rather than the execution of a genetic program for development. This is reasonable, and perhaps is an example of how the brain can be prepared to respond in certain ways in different environments (if environmental differences switch development onto different trajectories). Of course, genetic differences could be found to be the major factor in explaining cortical-growth differences. If so, plasticity shouldn’t really be contrasted with a genetic program for development – one set of genes might be correlated with a lower level of plasticity (the averages), and another with high plasticity (the superiors). But in both cases genes can underlie the very possibility of plasticity, with one set affording more than the other. If we take genes and plasticity to be placeholders for nature and nurture, we can see why the nature/nurture dichotomy is more imagined than real – each depends and utilises the other. As Matt Ridley says, nature acts via nurture. Genes can be selected for their capacity to contribute to the development of plastic developmental systems. Future research might address these issues in more detail, but for the moment it seems safe to say that the metaphor of the ‘big’ brain for cleverness is misguided – the secret of intelligence probably lies in the dynamics of cortical development. Like life, the journey is at least as important as the destination. Forgive me if this is little bit of a digression from the specifics, but I have always been curious about the role of neotony in evolution of intelligence, without I admit detailed research! Neotony, as I understand it, is the retention of juvenile features or delayed development to adult form. The evolutionary development of intelligence, would appear to be supported by an increased period of young brain development. We know that juvenile brains are more active in developing connections etc. (and we all know by the age we are interested in this stuff we are losing neurons and connectivity on a daily basis!). The longer the period of active development may be one (not the only) hypothesis for a mechanism of enhanced intelligence. Here I am thinking of this at the macro level rather than the specific individual. However would this be consistent with this pattern of cortical thickening? 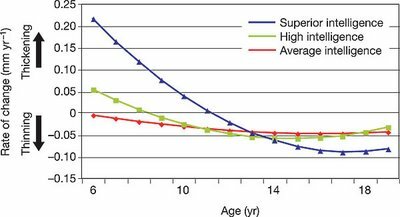 The ‘superior’ group have a delay then a surge of development that is correlated with enhanced brain function? Although the brain is very plastic in its development, and this would only be a partial contributor. Also, is there any research that relates development of physical maturity to intelligence, as there are anecdotal observations that the brighter kids are the ones that are physically more ‘kid-like’ for longer (nutrition etc. aside). Phil, I’m not too knowledgeable about neotony, so I can’t recommend any books that I’ve read on this topic, but I think Steven Jay Gould discusses neotony in the context of heterchrony in general in his early books Ontogeny and Phylogeny. I’m not sure though that being born with much neural development still to go, as humans are, is an example of neotony (although the changes in brain development could be associated with the retention of juvenile features into adulthood). The developmental timescale of brain development has shifted relative to primate ancestors, but perhaps not in such a way as to retain juvenile features (although the face may shown sign of neotony. It is a strategy that enables a larger adult brain to be built (if human babies were born at the same stage of maturity as other animals the head would be too big for birth to be possible). It’s not clear to me how this relates to this study of cortical thickening. I’m not sure I’d say that the ‘superiors’ had a delayed growth surge – they surged at the same time as ‘highs’ rose (and averages stayed the same), but started from different growth points and took different trajectories. As I suggested, we don’t know what sort of brain growth has gone before, nor what caused such different starting points for the different growth trajectories. It seems possible that different groups of IQ-stratified groups of people tend to inherit different combinations of genes and therefore different developmental programs for brain development. 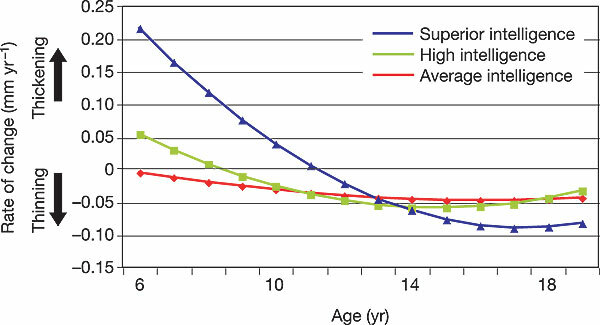 Perhaps genes in the ‘superiors’ tend to cause a slower rate of cortical thickening up to age 7 or so, which by virtue of thinness has greater potential for growth, and greater plasticity and learning potential, which leads through growth and pruning to a cortex of average thickness but somehow greater performance in IQ tests. So I think these results are compatible with whatever neotony is observed in humans, but I’m happy to hear from anyone who knows this subject better. As for the racial comparison stuff, I guess this is predicated on the idea that some races are neotonous to others, and show corresponding differences in average IQ. I don’t know of the literature on neotony between races (how are they defined, and how were the differences established? Are there any reliable studies? ), but the idea that genetic differences underlying relative performance on IQ tests among races is highly controversial. And such differences would seem to be implied if IQ was being linked to neotony (which would likely be under genetic control, with environmental inputs of course). So I’m sceptical about that idea for the moment.